← What type of Home educator are you ? We went to the Winchester Science Centre and Planetarium for the first time and loved it. They have some really great hands on science activities for the kids to do but as great as the Science side was (and I do mean great as we are definitely coming back again SOON) the 2 shows that we watched in the Planetarium were the highlights for us. Possibly because the kids have been reading a few Solar System books with their dad lately but more likely just because they were really well done. The first show we went to was The Planet Show (I believe it is daily). Brilliant. The hubbie and I were really impressed. You get taken on this amazing trip through space – the visuals are mind-blowing – the way they zoom in and out – just incredible. I loved seeing all the planets orbits and the close-ups, like the rings of Saturn – I have honestly never seen that before. My daughter was so impressed with the show that she asked if there was another one we could watch. So we also went to the Secret of the Cardboard Rocket. Now this show is designed for the kids. It is a story about two children who build a cardboard rocket and then with some imagination, a good book and little of magic they travel through space in their cardboard rocket. My seven-year old LOVED it – really really LOVED this. The story is sweetly woven to include many incredible facts and yes because we watched both shows there was some duplication but there was still a lot of new facts that we learnt from the Cardboard Rocket show. The kids loved the classification of the Rocky Midgets verses the Gas Giants (that is something that is going to stick forever). And the bonus about watching both shows is what they learnt has really been embedded – Mercury being half boiling half freeing, even though Mercury is the closest to the sun it is Venus that is the hottest, Saturn’s rings being made from ice rocks oh I could go on and on. The only two parts that were a bit confusing were – they pronounce Uranus differently in the two shows (something the kids pointed out immediately) and in the Cardboard Rocket when they get to Pluto they don’t make it clear it is a dwarf planet (something which was very nicely explained in the Planet Show). So naturally after a good educational day out, the home educator in me had a quick look for some activities and I found the Planet Scissor Activity Page (from Activity Village). I initially thought we could use the images to make a poster showing the order of the planets. But my son was not happy with the straight forward order, he quickly showed me a page (from his Planet Earth book), he wanted to show the planets orbiting around the sun. For those of you interested in trying to make the poster at home – we used 2 A3 size pieces of card for the background. And we also printed out this cool Orbit Model from Activity Village. I love this as it brilliantly demonstrates how the moon orbits the earth while the earth is orbiting around the sun. 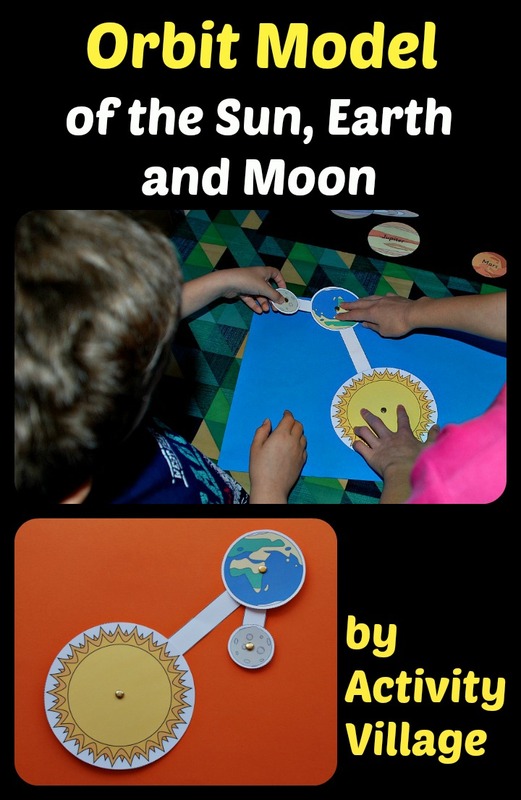 Both my kids agreed that using the orbit model and actually moving the moon around the earth while the sun orbits the sun explained it better than reading it in a book. This is NOT a sponsored post. I am just writing about a fun day out and the activities that we did afterwards. This entry was posted in Homeschooling and tagged activity village, home ed, home education, homeschooling, orbit model, planets, Space, Winchester Planetarium. Bookmark the permalink. Sounds lovely….and exciting outing for you all…. The outing and activity look fun!